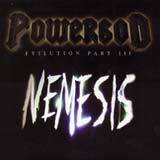 Powergod return with the third installment of the "Evilution" trilogy. I'll get right to the point… Only those fans who HAVE to have every power metal release out there will want to pick up this album. For everyone else, you can skip this CD as rest assured that you have not missed anything. The songs feature some really basic song structures that hold little excitement for the listener. Their power metal is still very standard with little emotion or feeling. I wonder if they read a book entitled "How To Make A Power Metal Album" before entering the studio. For the most part, each song is riff driven (basic, boring, & monotonous riffs) with some not-so-great solos and shredding that have trouble at times keeping up with the album's faster paced songs. During the course of some songs, there is an attempt to include a brief, demonic sounding voice in the background. Well, the result is quite silly as it sounds like a very poor imitation of Darth Vadar - ughhhh. In fact, the "epic" title track is absolutely ruined by this horrible spoken voice. But in the end, the simplistic and anti climatic song structures are what hold this album back - nothing exciting whatsoever. There is really nothing to distinguish one song from the next - no meaty riffs, no memorable chorus lines, no piercing solos, no melodic quality and an average vocalist. With bands such as Iron Savior, Elegy, Sentenced, Blind Guardian, Grave Digger, U.D.O., Lost Horizon, and Nocturnal Rites releasing (or set to release) such quality albums these days, I simply can't see how this album would appeal to discerning metal fans. Unless you need to have everything, this is certainly a release that can be skipped. Now that the "Evilution" trilogy is complete, maybe the band can recharge their minds and hopefully craft together a more inspired and interesting work.